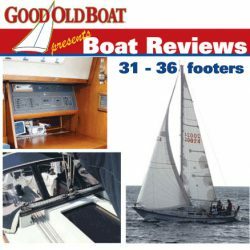 The Good Old Boat Galley Book is about simplifying life in your boat’s galley. It isn’t so much about what sailors cook as it is about how they manage to do it in a space the size of most shoreside bathrooms. It’s about making do as well as doing without. This book is about the basics: stoves and fuels and provisioning, as well as tips, tricks, and tools to make sure you never have to head for shore just because you’re hungry. Many of the galleys in the early fiberglass boats lacked amenities such as ovens, adequate stowage space for food and utensils, and coolers that stayed cool for the duration of a weekend cruise. No oven? No refrigeration? No ice? No problem! From the outset 10 years ago, Good Old Boat magazine has been running articles about life without a cooler, baking bread on a stovetop, and pressure cooking. 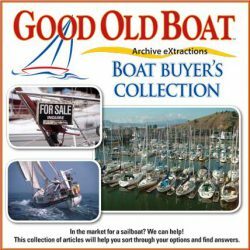 These articles, and many more have been collected into a useful volume, the Good Old Boat Galley Book. The volume is further enhanced by a bonus collection of tips, tricks, and (yes!) recipes from Corinne Kanter’s ever-popular KISS Cookbook. Additional topics covered by articles in PDF format are: drying foods, canning meat, what to do when the salad is gone, harvesting the bounty of the sea (fish and shellfish), making your own yogurt, growing sprouts, how to raise herbs aboard, preserving cheeses on extended voyages, simple bread recipes for small ovens, one-pot meals, solar cooking, conserving water, provisioning, storing and preserving the food you catch or collect, stove fuel alternatives, and the bare necessities if your mini-galley is in an even smaller trailerable boat!